Friends! We start the new series of reports on the work done. Reports will be less in size than devblogs, but we are going to publish it more often. There will be one usual devblog for every four reports. Let’s start with little joys: 11/09/2018 the number of messages on our forum exceeds 10 thousand. We rejoice at this messages even more than at notional users, that appeared in large numbers because of free keys. Let us introduce him – stickman. He isn’t the strongest mob, and to be honest - even weak. His habitat you can find everywhere. The stickman holds no danger but he is valuable because of the loot. Usually loot includes firewood for preparing of powder, that everybody needs. Now you can see the situation about demand on this loot clear, isn’t it? By the way, we weren’t fully sincere about weakness of the mob. You can occasionally meet a very strong one, that even cup raid won’t handle it. You can unexpected meet him in the suburbs, after looting his weaker brothers. 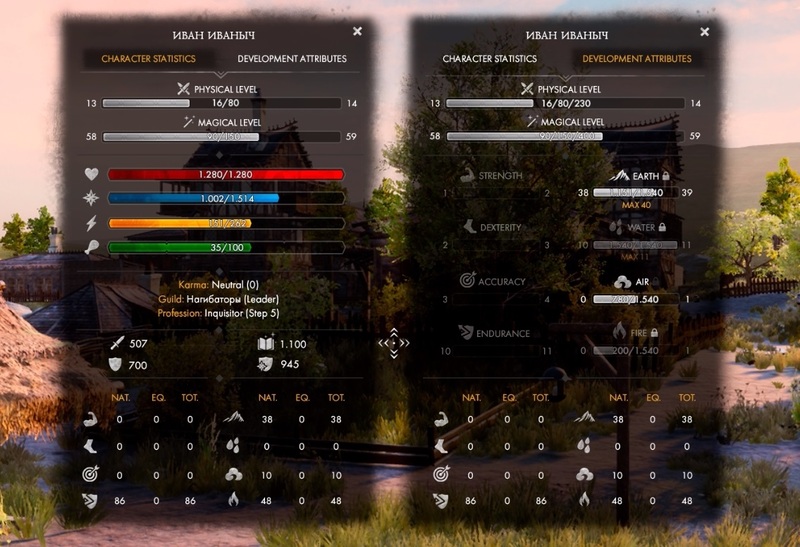 Also work continues on the UI. Now we’re working on the character screen. The apparent simplicity (because of the refusal from abundance of characteristics and indicators) seeks to adapt UI to the original system of character development. We already told about this system: “attributes - in the morning, level - in the night!”. Except the main information about levels of the character, HP and MP, energy, satiety, karma and profession, huge blocks are devoted to attributes, its minimum/gained/necessary quantity, opportunity to block the gaining of attributes and experience as a whole. In addition, we made the table showing not only the whole quantity but also different attributes - personal and item attributes. It simplifies the control of builds. We already showed the Tulglas city, where you can meet the buildings of different and original styles. Now we decide to show them in detail - moreover, now we’re working on the refinement of materials, the distance of detailing and quality of shadows of this buildings. In conclusion we need to answer at least the one of three eternal questions: “What to do?”, “whose fault is it?”, “When the alpha would be open?”. We choose the last one. Shortly: we expect alpha in October. 5. Updating AI mobs, adding new mobs and animations. These 5 points are the reasonable minimum, that we want to perform in the alpha. Yes, we increased not only the content but also quality requirements. It’s connected to our desire to please our test participants and to leave delightful aftertaste, brightening up the awaiting. Look forward to your comments on the forum or Facebook page!